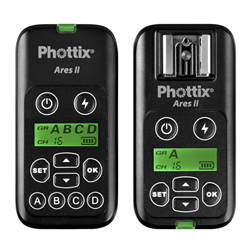 Phottix is returning to its roots with the introduction of the new Ares II wireless flash trigger system. Phottix is returning to its roots with the introduction of the new Ares II Flash Trigger System. In 2008 Phottix released a 16-channel trigger for studio lights, one of the company’s first forays into wireless radio flash triggering. Now 8 years later, technology has evolved one thousand fold and so has Phottix. The Ares II Wireless Flash Transmitter and Receiver System boasts the latest technology and is perfect for manual shooting with studio lights or hot shoe flashes. Photographers can choose from 16 channels where the first four channels are compatible with the Phottix Strato II Protocol. In other words, the first four channels can work with any Phottix Strato II Receiver and can be used to trigger other Phottix products such as Mitros+ speedlights and the award-winning series of Indra studio lights. Brand new to the Ares II is the Digital ID function. This secures the connection between transmitter and receiver so no other devices can trigger connected flashes unless they are using the same four-digit Digital ID code. The Ares II is compatible with the Sekonic L-478DR-PX light meter. This makes the Ares II the perfect fit for manual shooters and anyone else looking to learn how to control light and develop distinct lighting styles. Thanks to the included 3.5mm cable and adapter, the Ares II is a great way to add wireless triggering and meter compatibility to almost any studio strobe on the planet. Since its inception by a small group of like-minded photographers Phottix has been on the cutting-edge of innovation and excellence in the photographic industry. From the landmark Phottix Odin™ TTL Flash Trigger to the Phottix Indra360 TTL Studio Light, 2016’s TIPA Award-winning Best Professional Flash System, Team Phottix has and continues to develop new technologies while adapting existing technology with the feedback of photographers. Phottix’s current flagship trigger, the Odin II, was developed based on the input from professional and semi-professional photographers from around the world.